For a good number of years now my first comment after seeing any movie for the first time is almost always about the length of the film and invariably this turns out to be a complaint that the movie was just too long and could have benefited from a neat little five or ten minute nip-and-tuck. Around my house my wife and kids have gotten so used to hearing me say it that by now my 13 year-old daughter has begun to say the same thing. However, while I generally believe that most movies could benefit greatly from a five to ten minute trim, I’m not sure cutting that time off Around the World in 80 Days would do any good, simply because the movie needs more than a little trim. In order to make an impact the film needs to lose a good 45 minutes of time before it would even get to the point where you could say it would benefit from a good five or ten minute trim. Given a title like Around the World in 80 Days you’d think the movie would be a grand epic on the scale of Gone With The Wind, but unlike GWTW, Around the World just doesn’t have a story sturdy enough to support a 183 minute movie. (For an idea of how bloated it is, get a load below of it’s 4:17 trailer!) Clearly this was a lesson Hollywood learned as, while it is typical to bloat the running times of remakes, the 2004 remake of Around the World in 80 Days actually slashed 63 minutes of running time to tell virtually the same story. Having seen both, I don’t really miss the 63 minutes. The problem of the film, and why it’s so long, is that the film’s length isn’t driven by story, it’s driven by the process it was filmed in, which is a completely different thing. The person to blame? The man behind both the process and the this movie. 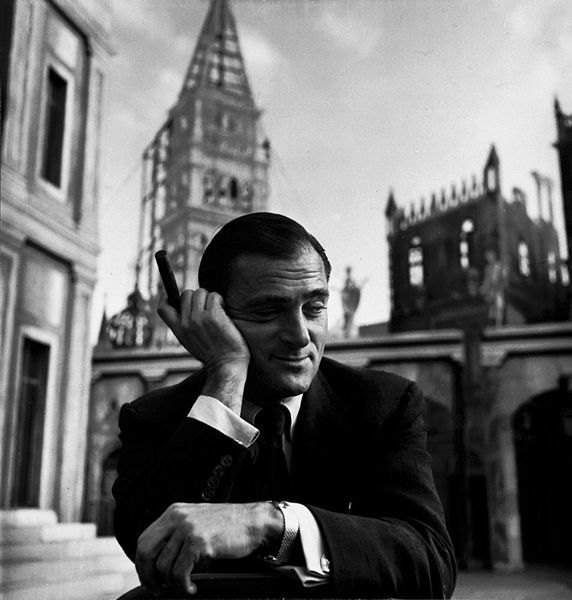 Mike Todd was an early supporter of the early widescreen format Cinerama, forming a company with the inventor of that process in order to bring it to the masses. Cinerama, unlike todays widescreen formats, when exhibiting the film three projectors and a curved screen required, creating a composite image that, when projected properly, appeared as a widescreen film. Unfortunately, when done incorrectly, there were fuzzy areas down the left and right hand thirds of the screen (which can be seen at left) distracting the viewer from the film. Despite the technical challenges, Cinerama process was used in a good number of features but ultimately died out in 1972. Not long after forming the Cinerama company, Todd (left) took his leave of it to help develop a widescreen process that eliminated Cinerama’s flaws. The resulte was Todd-AO. The first film shot in Todd-AO was Oklahoma! 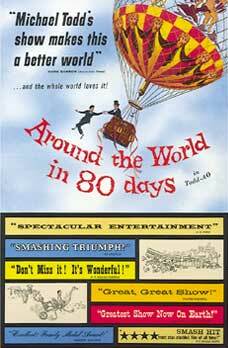 The second was his maiden effort as a producer, Around the World in 80 Days. As producer of the film, and owner of the process, Todd clearly wanted the film shot in such a way as to showcase the process – and therefore pad his bottomiline – and the result is a loated film, that plays like a travelogoue of beautiful scenery instead of an actual story. Over and over again the camera is merely pointed over the side of a hot air balloon or train or a ship, not because it furthers the story, but simply to show you what’s going by in all it’s beauty. When the camera isn’t pointed at the scenery – and admittedly, there is some beautiful scenery – it tends to be turned around on Niven and Cantinflas as they look wide-eyed at the scenery. Cutting out all the beautiful scenery might have been like taking all the spectacle out of the film meant to showcase wide-open vistas, but it also might have made the thing really move and meant I didn’t have to watch it in four pieces just to get through it. Because it was designed as a device to promote the process and the scenery, the film inevitably suffers everywhere. The characters are hardly developed in the least. All we know about Fogg (Niven) at the end of the film is that he is a punctual man and likes to play whist. Similarly, all we know of his valet, Passaporteau (Cantinflas) at the end of the film is that he’s very resourceful and apparently enjoys the company of women. One can imagine, then, that in a film where the leads aren’t exactly explored as characters, most others get even less time and so in a way watching the film is akin to watching somebody put on a show with paper dolls. It’s there, but at the end, there’s nothing to care about. Everything is flat and hollow. Aside from the novelty of Todd-AO was the fact that Todd went out of his way to try to coral stars to walk through his film in bit parts. Only, stars don’t do bit parts, which means he had to call them ‘cameos’ to get them on board. Apparantly that was his other innovation with this film – calling them cameos. For the most part I didn’t recognize the stars he gathered together – sure, I saw Sir John Gielgud and Noel Coward and the guy who played Tom, the union soldier who tries to arrest Rhett, Ashley and Dr. Mead in Gone With The Wind, but that was about it – and that was probably a good thing because the ones I really recognized, like Frank Sinatra almost literally winking at the camera, were distracting and made me remember I was only watching a movie. Fifty-five years on from it’s release the cavalcade of stars didn’t seem like it at all but I can imagine how, at the time of it’s release all the star-gazing helped cover the films shortcomings. It goes without saying that I don’t think the film was worthy of Best Picture, because it isn’t. Admittedly, it’s mildly enjoyable and somewhat amusing at spots – my favorite part is when Niven hands Catinflas a bag of money to guard and Catinflas promises to ‘cherish it like a woman,’ only to have Niven say ‘don’t make love to it, just watch it,’ it certainly got a chuckle out of me. But a couple of enjoyable scenes do not a Best Picture make. Anyhow, though it’s not worthy of Best Picture – the true Best Picture of 1956, Lust for Life, went unnominated in the top category – it’s not at all surprising it won. First, it had the novelty of the widescreen format. Second, it had the cast of thousands. Third, it’s only serious competition was from C.B. DeMille’s mammoth Biblical spectacle, and Easter staple, The Ten Commandments, and George Steven’s flawed masterpiece Giant – although, it’s worth pointing out that while Around the World in 80 Days was the nights big winner, that George Stevens won Best Director for Giant over Around the World in 80 Days director, Michael Anderson, must mean something. Fourth, and finally, sometimes you gotta love a spectacle. One of Around the World in 80 Days Oscar wins was for Best Adapted Screenplay, over the likes of such inconsequential films a Lust for Life, Giant and Baby Doll. Clearly, that it was nominated for, let along won the Oscar, is mind-boggling, given that the film was essentially 50% scenery and other nonsense, and the other 50% has little in the way of story or subtlety or any sense of drama at all. It’s mostly thin pleasantness, and yet it won a screenwriting Oscar. More mind boggling? The film has three credited writers. Three! I mean, given that half the film was scenery why didn’t they go ahead and give Lionel Lindon, cinematographer, a credit as well. The lone bright spot, for me, was the antics of Mario Moreno, more popularly known as Cantinflas. While Niven, as Fogg, was fairly one note, Cantinflas was a bundle of comic energy, doing everything from dancing on a table, to bull-fighting, to chasing every woman in sight. Sure, he doesn’t do any dramatic heavy-lifting, and his character is one-note and how and then he muggs for the camera, but at least he was fun to watch. Given his talents I wonder how he never became a star in America. I can only guess it was his Spanish accent – he was from Mexico – that got in the way. Two winners for the film either were dead at the time they won or soon would be. 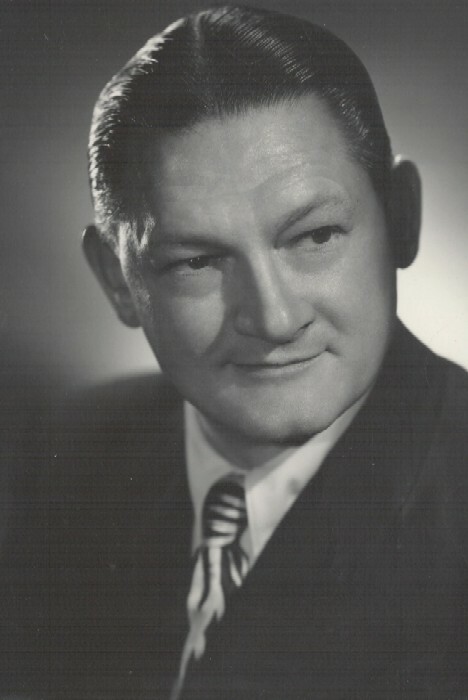 Victor Young, the man who wrote the score for the film, was nominated for a total of 22 Oscars – twice for four in a single year – but did not win until after his death, for Around the World in 80 Days. Somewhat less illustriously, Mike Todd, producer, would only make one film in his lifetime – this one – and take an Oscar for it. Less than a year later he would be killed in a plane crash, apparently while prepping an adaptation of Don Quixote. Only eleven films have managed to win Best Picture without receiving a single acting nomination. The first was Wings, the last was Slumdog Millionaire. Others include The Last Emperor, Braveheart, Lord of the Rings: The Return of the King and our subject here, Around the World in 80 Days. For a list of films seen and yet to be seen, click here. Please consider that for the UK at least the post-war years were grey, the film was Technicolor escapism. Interesting blog incidentally.